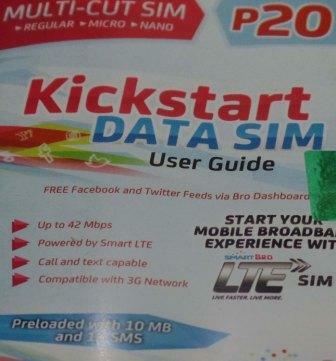 If you want to experience Smart or SmartBro fast LTE wireless mobile internet connectivity you can get Kick Start data SIM for the price of 20 pesos. It’s capable to connect LTE network on your area and also compatible with 3G network as an alternative in case 4G/LTE signal is quite on your location. The SIM fits on almost phone units as it comes in multi cut from regular size, micro and even nano. It also includes some freebies like free text and internet once you activate the SIM. Using this SIM you can register to Smart Surfmax Promo for internet browsing all you need to do is reload your account via Smart Bro Load card, thru text or even via Smart Money. You can also manage your account by registering to MySmart, just add your SIM number and verify. It will also automatically open your Smart Bro dashboard via browser once you use your SIM to connect to internet. From there you can also check your number, remaining load balance and status on account management tab. You can use this SIM on your mobile phone, USB broadband and Pocket WiFi, just use the right size base on SIM slot of your device.